Kids of all ages love to make things. Whether they are using remnants or building blocks, children take absolute delight in creating something. They get so much satisfaction and excitement from their finished project. Imagination and expression is a very important aspect of a child’s development. By expressing themselves creatively, they will attain a sense of achievement. Gifts made by children are something that will be greatly appreciated and treasured. Use a rigid piece of cardboard and attach a 12 month calendar to the lower half. Then get your child to draw a picture around the calendar. Attach a loop for hanging the calendar. This is a great Christmas present. Recycle a nice glass jar. Decorate the lid with stickers or paint. To make bath salts, add food colouring and essential oil or perfume to Epsom salts. Mix well to distribute colour and spread mixture out on a sheet of baking or wax paper to dry for a couple of hours. Make enough to fill the jar. Tie a ribbon around the jar and you have a great gift of bath salts. Take a length of ribbon a bit longer than a book page. Knot at each end of the ribbon, beads, buttons or charms. This is a great way to mark a page of a book. Paint the palm side of your child’s hand in a bright non-toxic colour and then press the hand firmly onto a paper plate. Let the paint dry completely. Attach a loop to the top of the plate for hanging and the outer edge or bottom of the plate can also be decorated with ribbon. With permanent marker, you may like to write the date and child’s name on the plate. This is a great present for grandparents, parents or aunts and uncles. Choose a tin, jar or box with a lid. Decorate the outside and glue a small picture of your child on the lid. Use the computer or handwrite sayings relevant to the person receiving the gift. They can be things like ‘I love it when you visit’ or ‘I love you reading stories to me’. Cut into strips and fold roughly and place in a decorated container. Small hand drawn pictures or small photos can also be added. Make sure to include one strip of paper with the date that this gift was made. These boxes will create many happy memories. Making crafts is a hobby started young that will take you into adulthood. As your age progresses, so will your skills. 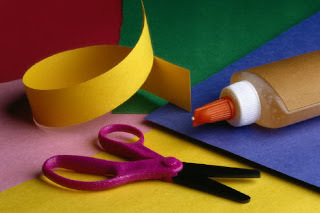 Starting crafty activities at a young age will teach children how to use glue, scissors and will encourage their creative mind. Crafty kids would also enjoy having their own self inking stamps. Custom rubber stamps can be ordered online from websites such as Vistaprint, and you can have them personalized with your child’s name or for younger children, stamps of their favourite things, such as flowers or shapes, will make it easier for them to do crafty activities.